One thing that many women have in common is the love of being tan. There is just something so satisfying and confidence booting about having a glow. Being a naturally fair-skinned girl, I tend to gravitate towards self tanners more and more this time of year. Tanning beds are a huge no-no for me because 1.) I would severely burn and 2.) IT IS SO UNSAFE. A much safer, cheaper, and easier alternative to tanning beds is self tanning! I have been in love with self tanning for quite some time. When I first started I was orange and splotchy and very far from the bronze goddess look I was going for. Since those frightful days I have learned quite a bit about self tanning and the important steps it takes to achieve a stunning, natural-looking glow! I have tried MANY self tanners throughout my tanning journey. Some have failed miserably, and some I fell in love with. Today I’m going to be sharing with you guys my most recent tanning obsession! Tarte is in my top ten favorite makeup brands of all time. Not only are their products high-quality, but their prices are fair and pretty affordable! My fav self tanner at the moment has been Tarte‘s Glow With the Faux Foaming Self Tanner. I prefer foaming tanners over lotion because it’s easier to see what you’re doing, and you usually get instant color. What I love about Tarte’s take on the foaming cleanser is how dark it is, its’ smooth consistency, and how well it blends and applies! There is nothing worse than a blotchy, uneven tan, and if applied correctly this tanner comes out perfect every time! Now I say “if applied correctly” because there are precautions to take when applying self tanner. You need to make sure your skin is shaved, exfoliated, and ready to go! Another amazing thing about this self tanner in particular is that it come with a super adorable/soft/awesome tanning mitt to make your life easier and your hands stain free. It’s more important than you think to use a tanning mitt rather than your hand. The mitt is designed to apply the foam flawlessly, without leaving your hands stained and orange. So make sure you put on that mitt before you apply your tanner! Self tanners can sometimes be harsh on the face causing you to breakout or become splotchy. 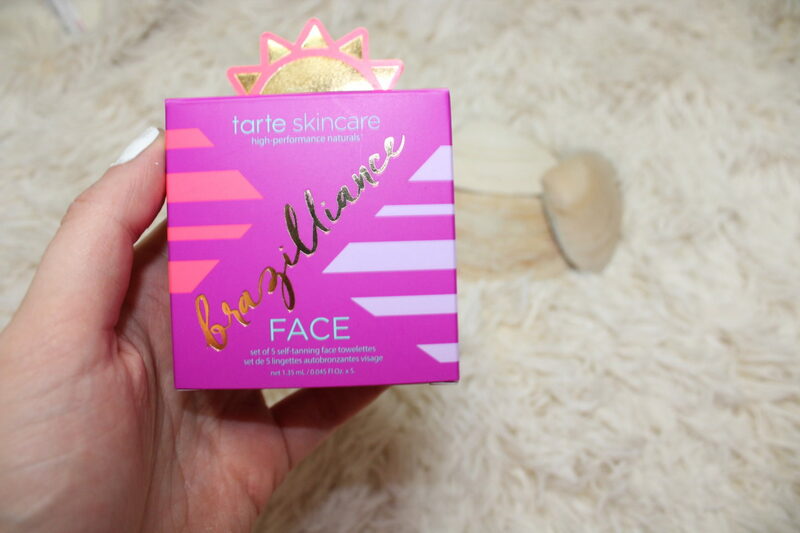 To prevent that from happening I use the Brazilliance Face Tanning Wipes also by Tarte. These wipes are designed specifically for the face so they’re gentle on all skin types! The tan develops over time, so there isn’t any color payoff which is kind of a bummer. But honestly the lack of instant color is worth it if I don’t get zits in return! I hope this post gave your guys some tanning tips and inspiration!! I cannot wait for the warmer weather all the time so I can lay out and get a natural tan! Until then, self tanning will do the trick just fine 😉 What are your favorite self tanners? I would love to know in the comments! I’m always open to try new products! Get your glow on, babes. Pamper Your Hair w/ Eva NYC!! Get to Know: Winky Lux!! "5 Dresses To Spice Up Your Spring/Summer!" "Tips To Savvy Shopping: How I Score Awesome Deals!!" Love this!!! I really need to get in to this more because I avoid the sun quite a bit. This article was very helpful because I always wondered what to do for tanning the face. And, I’ve never useda mitt. That would certainly help a great deal. I have some tanners here from last year or the year before.lol. I wonder how long they are good for. Want more fun and fashion? Subscribe to know when I post new content.